If you are looking for the best pumpkin seed recipe ever you have found it! Seriously this roasted pumpkin seeds recipe couldn’t get any easier or tastier! Every time you get your hands on a pumpkin, you are going to want to make this amazing Toasted pumpkin seed recipe! This roasted pumpkin seed recipe or toasted pumpkin seed recipe (whichever you want to call it when you cook pumpkin seeds in the oven) is AMAZING! This is the pumpkin seeds recipe that we have been using for YEARS in my house. I originally posted this roasted pumpkin seed recipe back in 2013. 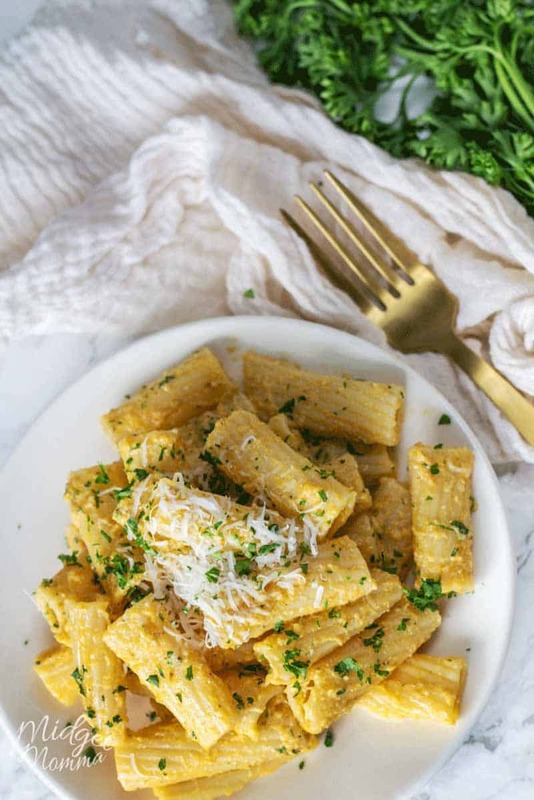 We got the chance to update the photos, so you can see just how amazing this recipe is! 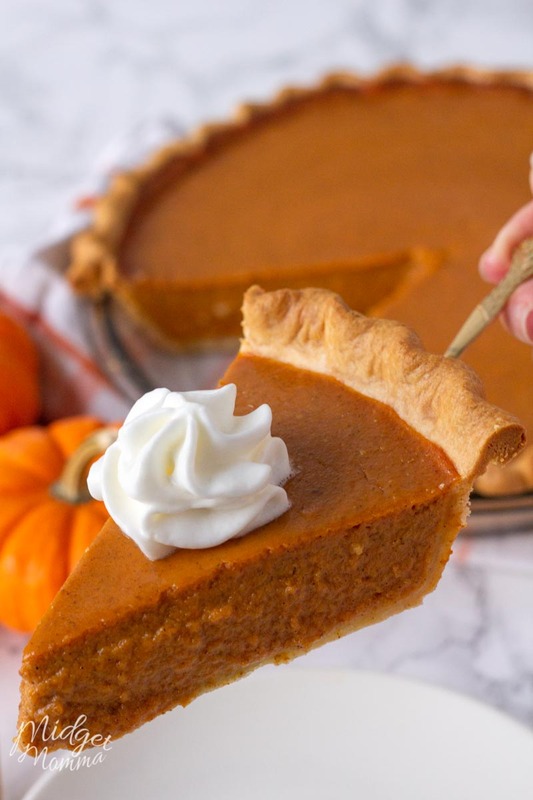 Trust me, this pumpkin see recipe tastes as good as they look in the new photos! Whenever we carve pumpkins, making homemade pumpkin seeds is a must. It is totally believed in our house that wasting them would be a horrible thing. If anyone is not a fan of pumpkin seeds, feel free to give us yours and we will enjoy them! However I have a feeling, that anyone who says they do not like pumpkin seeds only says so because they have not made them the way that we do. If you make thing other ways you do not get the perfect amazing crunch that belongs with a pumpkin seed. Not cooking pumpkin seeds properly is going to give you pitiful pumpkin seeds, that are rubbery and just plain ol gross. 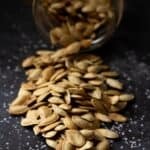 If you are looking for another awesome pumpkin seed recipe, then you should also try the sweet and salty pumpkin seeds. Oh they are sooo good too! I always give my kids the job of cleaning out the pumpkin, and cleaning out the guts. They have fun doing it and I don’t have to worry about the gross on my hands. Although the gross on your hands is totally worth the ending result of super tasty toasted pumpkin seeds. Cleaning pumpkin seeds is super easy. Just remove them with the pumpkin flesh from the pumpkin and put it all into a large bowl. Then use your hands to separate the seeds from the pulp and put the pumpkin seeds into a strainer. Once you have all of the pumpkin seeds from the pulp separated and in your strainer rinse them with water well. Pumpkin Seeds make an amazing snack! Seriously, they are so healthy, full of flavor and really they fit with just about any way of eating. From low carb, to keto, to low fat and beyond. Pumpkin seeds are low in calories, along with being high in fiber. They really do make the perfect snack! If you are looking for a healthy snack then you are going to love pumpkin seeds. 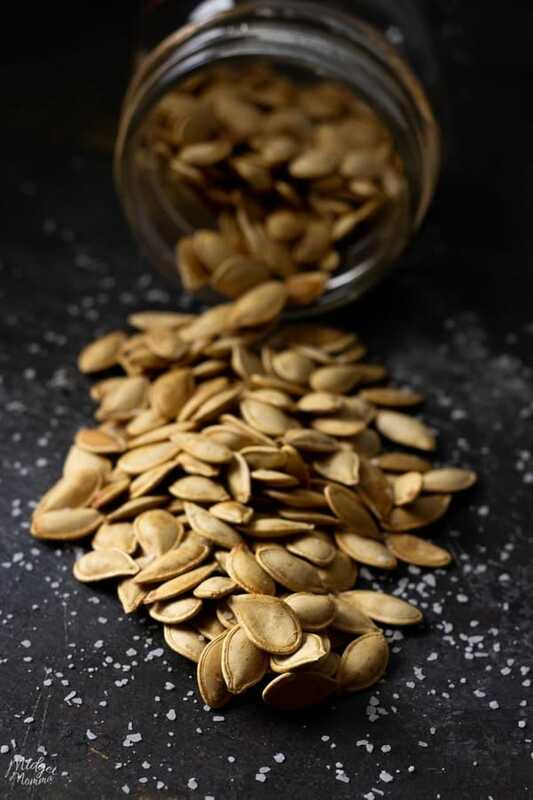 If you are eating low carb or keto, pumpkin seeds are an awesome snack! 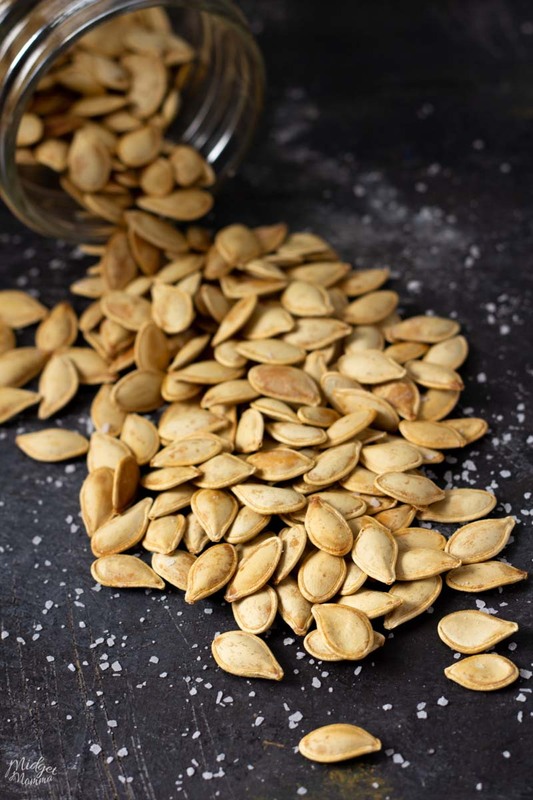 One 1/4 cup of this pumpkin seeds recipe has just 2 net grams of carbs! (3g carbs – 1g fiber = 2g net carbs)! 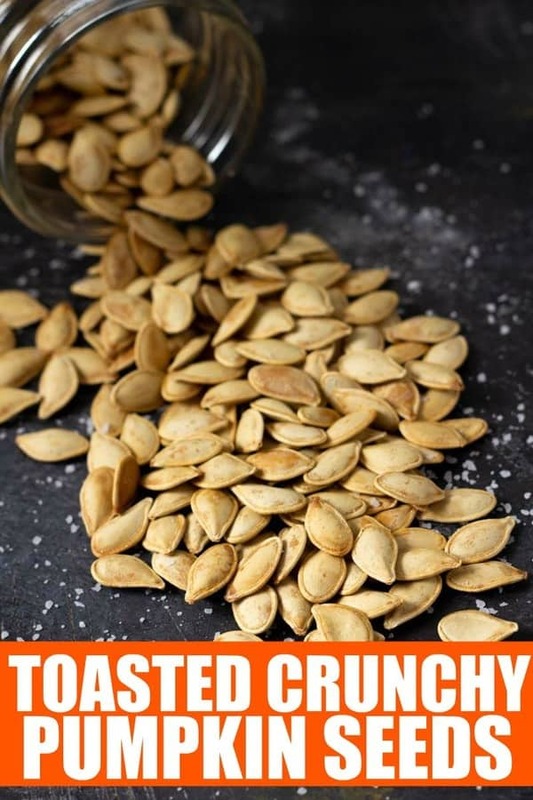 This toasted pumpkin seed recipe is super easy and it gives you the most amazing, crunchy pumpkin seeds with the perfect amount of salt. The trick to making pumpkin seeds amazing is how you cook them. 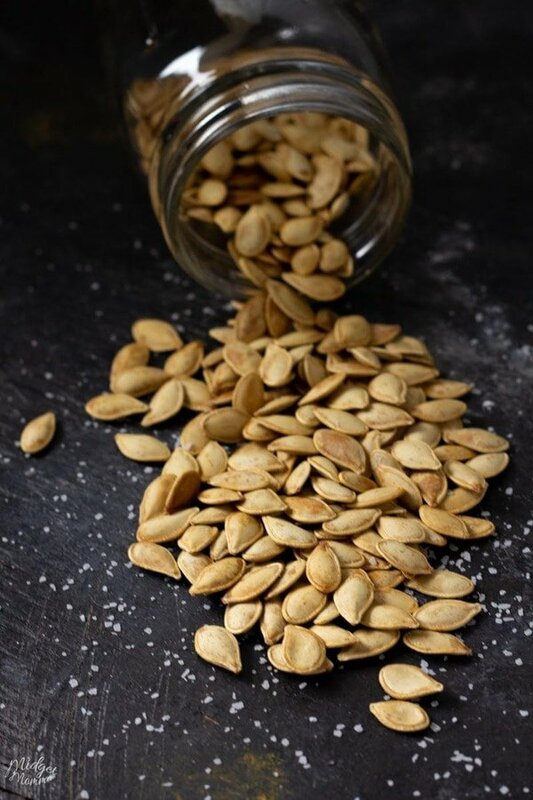 If you have more or less then 3 cups of pumpkin seeds, you will add 2 cups of water and 1 tablespoon of salt to the pan for every half cup of pumpkin seeds. This toasted pumpkin seed recipe is super easy and it gives you the most amazing, crunchy pumpkin seeds with the perfect amount of salt. Scoop out the seeds from the pumpkin. 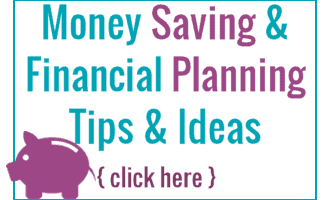 Place the pumpkin seeds in a colander and run under water to rinse and separate the seeds from the everything else. Measure the pumpkin seeds in a measuring cup while putting the the seeds in a pot. 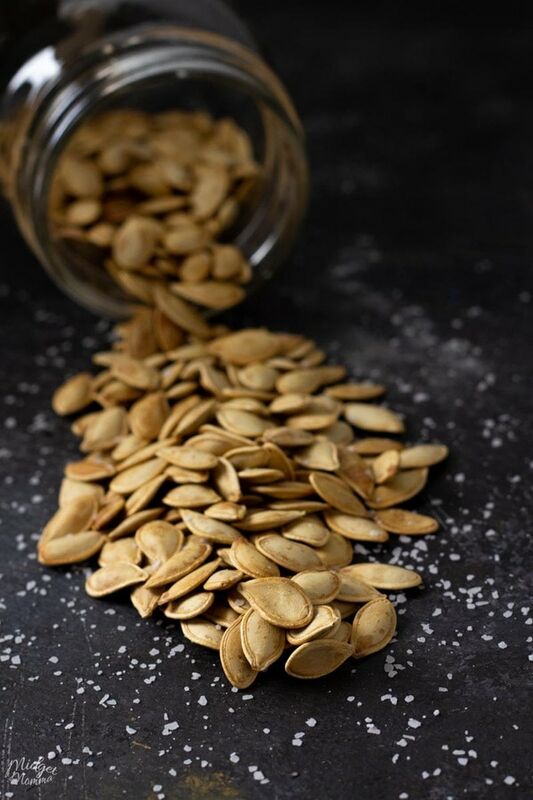 Add 2 cups of water and 1 tablespoon of salt to the pan for every half cup of pumpkin seeds. Bring water to a boil and let simmer for 10 minutes. Remove from heat and drain.Toss the seed with the olive oil and salt to taste. Bake on the top rack until the seeds begin to brown 5-20 minutes, depending on the size of the seeds. Keep an eye on the pumpkin seeds so they don't get over toasted. When nicely browned, remove the pan from the oven and let cool on a rack. Let the pumpkin seeds cool all the way down before eating. 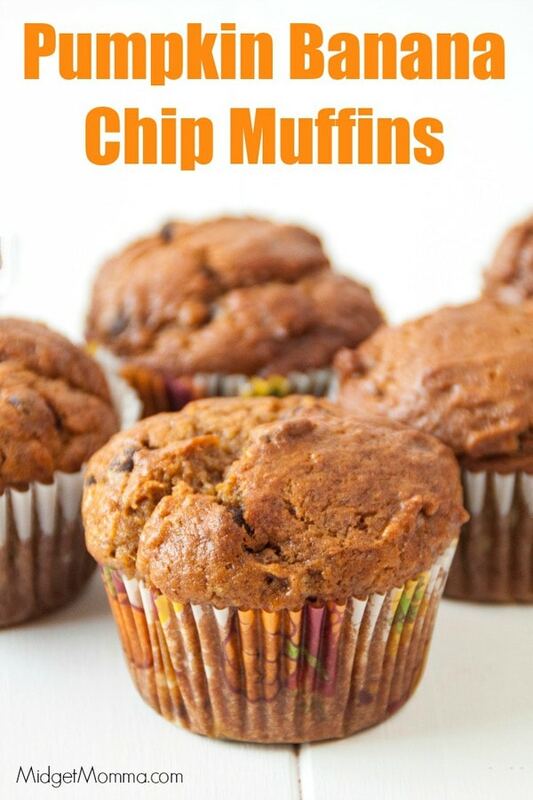 If you love pumpkin like I do then be sure to check out these other tasty pumpkin recipes!